Trekking is one long-term activity that draws repeat visitors to the country. 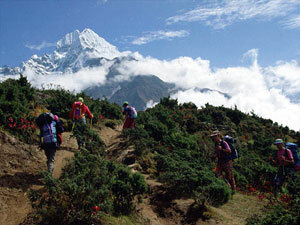 Therefore, Nepal is the ultimate destination for the trekking enthusiast. It offers a myriad of possibilities from the "short and easy" walking excursions to the demanding and strenuous challenges of the snowy peaks and their foothills and valleys. But however easy or moderate, or strenuous, there is something for every palate that goes with trekking in Nepal's hills, mountains and hinterlands, the most rewarding way to experience Nepal's indomitable combination of natural beauty and cultural riches is to walk through the length, breadth and the altitudes of Nepal. Trekking in Nepal is a much a unique cultural experience as well as an ultimate Himalayan adventure. Nepal has been the dreamland of the tourists for a long time. Nepal invites, welcomes, charms and bewilders the visitors. Those who have already visited Nepal cherish the desire for a second visit and those who have heard or read about the kingdom make a plan to visit the country. It gained its name because Prince Charles trekked here. This is an easy short trek that offers good mountain views, ridge walking, forests, rice fields and different cast villages. Few places in the world have such a splendid variety of natural beauty as the Annapurna region. It is a rare combination of long arrays of snow-capped peaks. A sacred valley ringed by enormous peaks, the Annapurna Sanctuary is a hidden glacial hollow that shimmers like a jewel in the mountains. This is a trek to a land of enchantment. No one can fail to be pressed by. Day white water Rafting on the Trisuli, few places in the world have such a splendid variety of natural beauty as the Annapurna region. The flora and fauna are other ornaments of the Sagarmatha National Park. The story of the yeti is still a mystery to the world from the Kahumbu region. With eight of the world's ten highest peaks, Nepal is loaded with spectacular mountains vistas. Everest trek in justifiably famous, not only for its proximity to the world's highest mountain ( 8848m ) but also for its friendly Sherpa people, picturesque villages great variety of cultures and traditions, colorful festivals and monasteries. The flora and fauna are other ornaments of the Sagarmatha National Park. The story of the yeti is still a mystery to the world from the Kahumbu region. Arrive in Kathmandu; you'll be taken to your hotel. While in Kathmandu you will have time fascinating Buddhist and Hindu temples and shrines reflecting ancient local traditions are highlighted on our guided tour. There's time to explore the city's many charms on your own too. In the evening a delicious welcome traditional Nepali well come dinner await for you. Stay overnight in Kathmandu. After breakfast, we'll visit Swayambhunath temple, and said to be 2000 years stupa on a hillock offers breath-taking view of Kathmandu City. We will then process to Visit Pasupatinath and Bouddhanath. After lunch we'll visit Kathmandu Durbar Square, Patan (Lalitpur) - which is the oldest of the three major cities in Kathmandu Valley - famous for its Buddhist monuments and Hindu temples, and you can catch the traditional artisans working with wood, stones and metals. Stay overnight in Kathmandu. This morning we will be transferred from your hotel to Kathmandu Airport for our domestic flight to Lukla. The flight itself is awe-inspiring as we fly parallel to the Himalayan giants bordering Nepal and Tibetan China. Flying time to Lukla is approximately 40 minutes. Upon arrival in Lukla, we will be met by our local guides and porters. There will be time to explore the village whilst the Sherpa crew sort and load equipment. Lukla lies at an altitude of 2850m ("luk la" = place of sheep). From Lukla we descend on a wide trail northwest to the village of Choblung in the Dudh Kosi Valley. The valley radiates energy through beautiful pine and rhododendron forest. The walking is easy and we follow the river's course, passing through the village of Ghat. Our destination is the small village of Phakding where accommodation is provided in the form of Tea House Lodges. From Phakding we head up valley on a busy trail: porters from the lower Solu district in the south ferrying supplies to Namche, Sherpas with their Zopkio (half yak, half cow) taking trekking or climbing expedition equipment to the higher valleys. Continue along beside the Dudh Kosi amongst beautiful alpine scenery, through the fragrant blue pine and fir forest, glimpsing spectacular views of Kusum Kangru (6369m) and Thanserku (6608m) along the way. We again cross the Dudh Kosi, to the western bank at Jorsale prior to trekking through the entrance to the Sagamartha National Park. Continue stream along the banks to the confluence of the Bhote Kosi and Dudh Kosi, it is here we begin our first sustained ascent to Namche Bazar after crossing the large suspension bridge. Walking at a slow pace, we have fantastic photographic opportunities as the peaks of Everest (8848m), Lhotse (8511m), Nuptse (7879m), Arna Dablam (6856m) and Taweche (6542m) come into view for the first time. Climbing again, the path takes us through pine trees to reach the distinctive horse-shoe shaped bowl containing the village of Namche Bazar. Stay in the heart of the village. Stay overnight in Namche Bazaar. In the morning we descend to the village of Shanasa and then contour to Trashinga where the trail drops steeply to cross the Dudh Kosi at Phukitenga (3250m). A break is taken here by a series of water-driven paryer wheels. In the late morning we initially climb steeply before the trail levels out to ascend gradually towards Thyangboche. It is a steady ascent of approximately 2 ? hours through pine fir, black juniper and rhododendron forest. Thyangboche is set in a beautiful meadow, high on a ridge surrounded by towering Himalayan peaks. A peaceful, tranquil position, surely one of the wonders of the world and the Thyangboche Monastery is spectacularly situated. The monastery dominated by the gamma with its prayer flags and many stones was founded in 1916 as a meditation centre. Stay overnight in Thengboche. We are now well above the tree line and your journey today brings you to Dusa from where you descend to a stream at 4850m. We begin our climb of the Khumbu Glacier en route to the tea shops at Dughla. Continue along the moraine of the glacier, with views of Kalar Pattar and Pumori to reach Lobuche at 4930m for your evening stay. This will be your last stop before your climb to the base camp tomorrow. Take time to rest and acclimatize for this unforgettable day. Stay overnight in Lobuche. Follow a similar trail through a forest of juniper, rhododendron and fir to Phunkitenga; you continue on to cross the Dudh Kosi for a steep descent to Trashinga. After lunch at Shanasa you make you way back to Namche Bazar. Following a steep descent passing the Bhote Kosil, crossing the river, follow the bank to Jorsale, then to Monjo for overnight. Stay overnight in Monjo. After breakfast, you're free until we pick you up to airport for your next destination.